The Beauts fell in OT in a GREAT Isobel Cup matchup. We break the game down in detail. Alex Nylander gets called up and is starting to fit in! Dare we say finding chemistry with his new linemates??? We also talk to Evan Schemenauer of the Saskatoon Rush broadcast team and talk about the recent Rush vs Bandits matchup. Don't miss the preview of our upcoming Sabres Drought Madness bracket!! 2 Buffalo hockey teams are heading towards championships! The Beauts are heading to the Isobel Cup Finals next weekend and the UB Men's Hockey team is headed to the ACHA National Championship Tournament. We talk to head coach Jeremy Kerston. 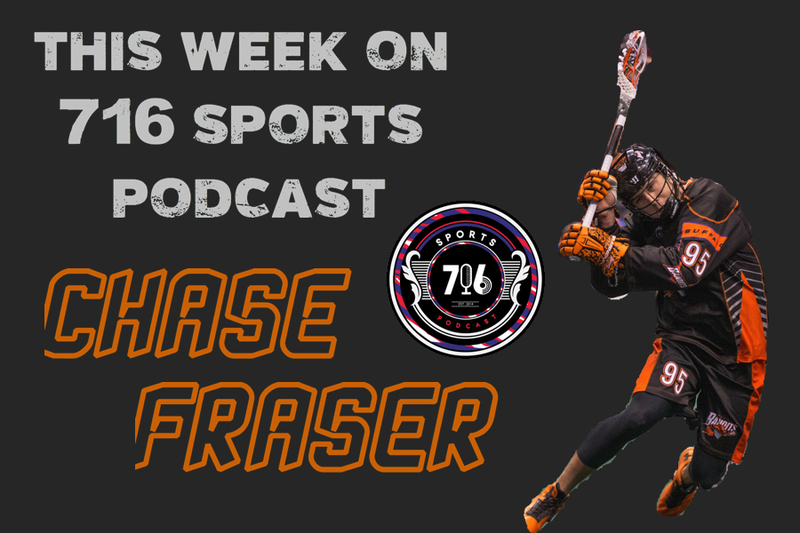 We take a deep dive in to the Buffalo Bandits emotional rollercoaster of a weekend and newest Bandits Forward, Chris Cloutier calls in! We then talk to Chris Ostrander of Two In the Box about how the Sabres can improve their spotty gameday presentation. Great show this week! 20 Questions: After watching Jason Pominville block his own shot, the 716 Boys take a break from reviewing the current games and instead bounce around the Buffalo Sports World with 20 random questions. Is Linus Ullmark the man for next season? What current Bills will make the Wall of Fame? What’s the key to a great salad? Plus, we talk to ______________ from the Buffalo Bandits and have him answer your Facebook questions. The Buffalo Bandits are the hottest team in Buffalo right now and nobody is talking about it! But we're here for ALL OF IT. Steve, Jeff, and Mike break down the scorching scene over at Banditland! Sabres make a BIG splash and trade Brendan Guhle for Brandon Montour. What do you think of the trade? We tell you what we think and we all have varying opinions. We also talk about the Bandits and Beauts impressive win streaks. Is it time to cut Housley loose? Why aren't other teams afraid of making mid-season changes but the Sabres are? Deadline coming up Monday! Will we see addition by subtraction? Also, what's up w/ cow stomachs?? Jack Eichel is, uh, pretty good at hockey. Playing like one of the world's best players right now. Should JBotts call up Rochester Skill guys to get the 2nd and 3rd lines going? Bills, Josh Allen and the Defense! Good and fun Bills ARGUMENTS this week! Buffalo Sprotz Debate: The Throw or The Drop?! - Sabres Drop 3 Straight - Allan Davis of WGR 550 Calls In! Which was it?! The throw or the drop?! Allen's play polarizing! FUN conversation on NHL Offer Sheets and Toronto's current crazy situation! What's going to happen with Matthews? Great interview from Allan Davis who is WGR's Program Director. Click for auditory pleasure. We start the show with 30 mins of breaking down the past two weeks of Sabres non-stop winning, low-key players doing big time things, and then Mike Peca calls in and talks about his uber successful Buffalo Jr Sabres hockey team which is ranked 5th in the nation, his time being an NHL captain, and his thoughts on the current state of the Sabres. Whoooo! .500 for the first time since 2013! <---thats CRAZY. They look pretty good and have been entertaining! Is this Eichel's big year? Has the real Samson finally stood up? Thoughts on Dahlin. Hutton and more! An Ugly Win For the Bills - Sabres Are Above .500! The Bills won in UGLY fashion. Is Josh Allen going to figure it out?? Defense looks great. Matt Milano is developing into a star. Much more. Sabres break .500 for the first time since 2013! They look...above average! Lots of solid Sabres talk in this show. Offense Falls Flat In GB - LOTs of Sabres - Budd Bailey Calls In! Josh Allen didn't look great, but neither did the o-line or the recievers! What needs to be done?? Budd Bailey formerly of the Buffalo News calls in and chats #Sabres and #Bills. Sabres BOLD predictions (a free pass to say something dumb. Lots if Sabres talk in this one! We will be doing way more and more in-depth Sabres talk this season! Don’t miss our lavish Canadian candy segment! Pat Moran of Moranalytics Podcast joins us to discuss the current happenings with @theathleticbuf and the Buffalo News sports writers. Do the Sabres make a deal on Draft Day? Is it ROR and how do they get better/faster wingers?? Also, Nathan Peterman is outshining the competition?? We talked Sabres hockey for an hour plus! Not a single mention of quarterbacks! yayyyy. Brian Duff called in and talked Sabres, ROR with us and much more. A ton of different Sabres talk in here for you all. Thanks, Brian!